Sydney being one of the most expensive place to live in the world makes eating out quite expensive. 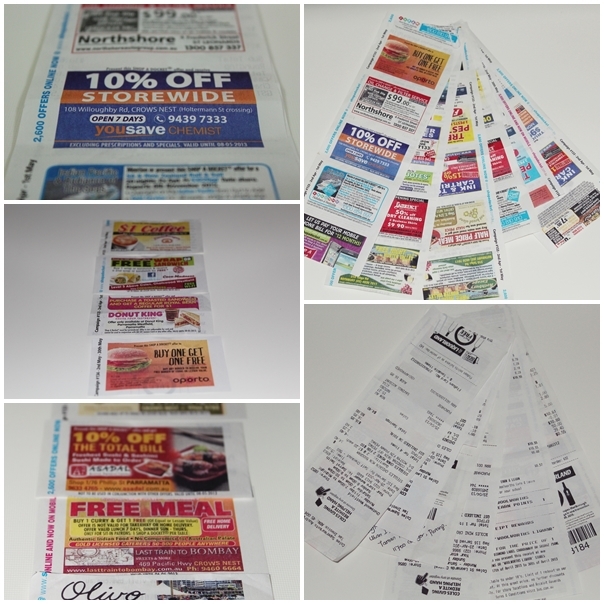 Having said that, there are some ways to save on meals by using coupons or dine in value-for-money restaurants. Otherwise, cooking your own meal at home is a cheaper option. Here are some suggestions on where and how to save on meals (best for sharing between two or more people). If you have more ideas and suggestions, feel free to comment on the post. I'm sure many of us would love to know. Dockets from Coles Express at St Leonards has a "Buy 1 Free 1" deal of equal or lesser value from Oporto St Leonards. This is great for two to share especially if you need quick lunch bite or in a hurry to go. 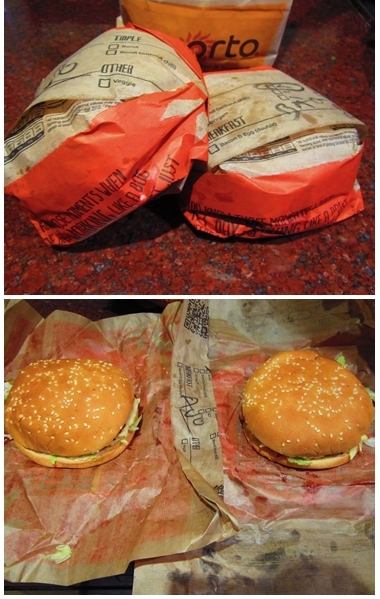 I got two burgers (Double Bondi & Otropo burgers) only for the price of one. Ka-ching! 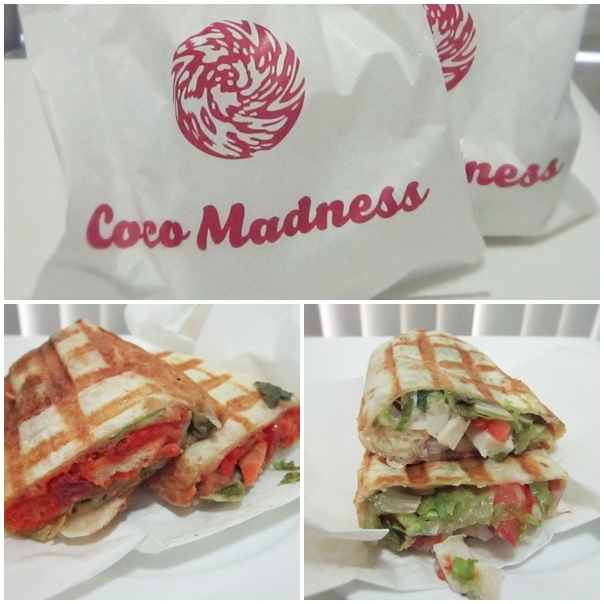 At Coles Chatswood, it has coupon for Coco Madness which offers "Buy 1 Free 1" wrap/sandwich deal. Similarly, it must be of equal or lesser value. There are a range of sandwiches and wraps to choose from this small store in Westfield Chatswood. I got Tandoori Chicken wrap and Chicken Club wrap to share with my partner and would recommend to try the Chicken Club. 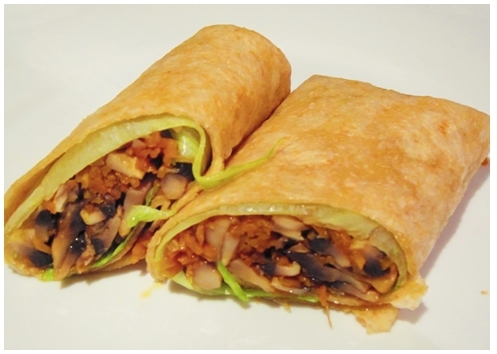 These wraps are nicely toasted (if you prefer), cut into half and wrapped individually for each half. Clean, neat, and nice. Ka-ching! Buy a sandwish and get a regular coffee for $1. Dockets from Woolworths Town Hall. Dockets from Coles in Westfield Parramatta. 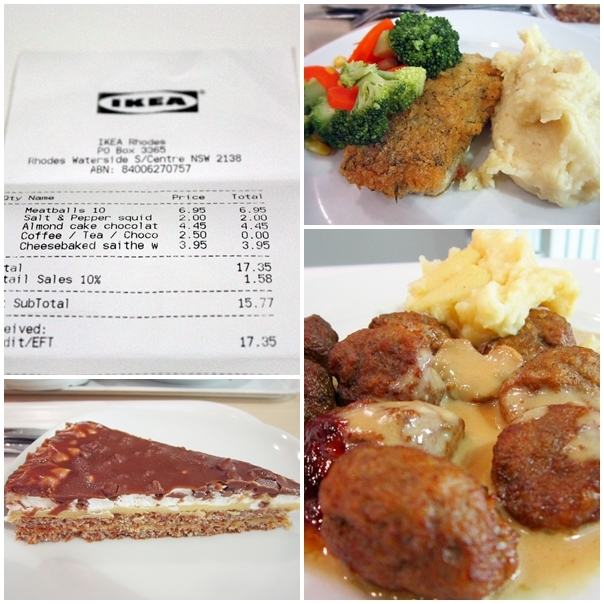 I love IKEA - the furniture, concept, and the restaurant. A stroll in the showroom hall is always inspiring! I don't usually buy things from IKEA every time I'm there but I never fail to eat in IKEA Restaurant. The food is cheap, balanced and delicious. The total price for two mains, one dessert and a cup of coffee is only $16! Ka-ching! The Chocolate Butterscotch Almond Cake is highly recommended! There are food courts in most shopping malls like Westfield, Market City, Mandarin Center, etc. They offer a wide variety of selection from Asian to Mexican food and the prices are cheaper than regular restaurants. Though the atmosphere might not be as good as dining in restaurants, the taste is still good if not better. Despite all the savings, it's important to remain a healthy and balanced diet. Don't forget to indulge yourself once in a blue moon! Another great way to save on eating in Sydney is The Entertainment book. We use it all the time to save money on meals. They have different dining options too based on your budget. yep - for those young folk who imagine that takeaway is cheaper than shopping for food to cook at home - here's my formula I've worked out - for the same $10 you might spend on a takeaway meal, you can buy enough food for 3 meals cooked at home - and if you cook once, and prepare 2 meals to take to work, you will have a healthier meal (less fat/salt/sugar) for a third of the price - money in the bank ! For home cooking, invest in a crock pot and you can feed yourself on a week simmering all sorts of things in your pot. Eat alone, eat with others, doesn't matter- it'll keep as long as you keep it covered and heat everything up thoroughly. Most food courts/ areas have afternoon specials around 330pm onwards. That goutmet baguette was $9 now $4, the devilish choc mud muffin is now even more irresistible when its $2.50 down from $6 or on Fridays get a gormet patiserie large cake for half price. Other meals like a stir frys, salads, yoghurts.. Hell if you have an iron stomach try out three sushi roles for $5 with ginger. (all from the MLC centre in martin place.) Understandably some may not like food that may have been sitting there for an hour or more but if you have $10 left until next pay, having a thrifty late lunch looks pretty damn good.